Visualisation of the Monument From Those You Saved, 2014. Unrealized project of the monument From Those You Saved, 2015. The monument honoring the Poles who rescued Jews during the German occupation. Organizer of a competition: the Remembrance and Future Foundation. Location: terrain next to the Museum of the History of Polish Jews. Version 1 – granite and concrete. The Star of David made out of granite. The concrete path. Version 2 – concrete. The Star of David made out of concrete (dyed in batch and polished). The concrete path (natural colour). Metal lettering (steel) level with the surface of the concrete slab and subject to natural corrosion and abrasion. 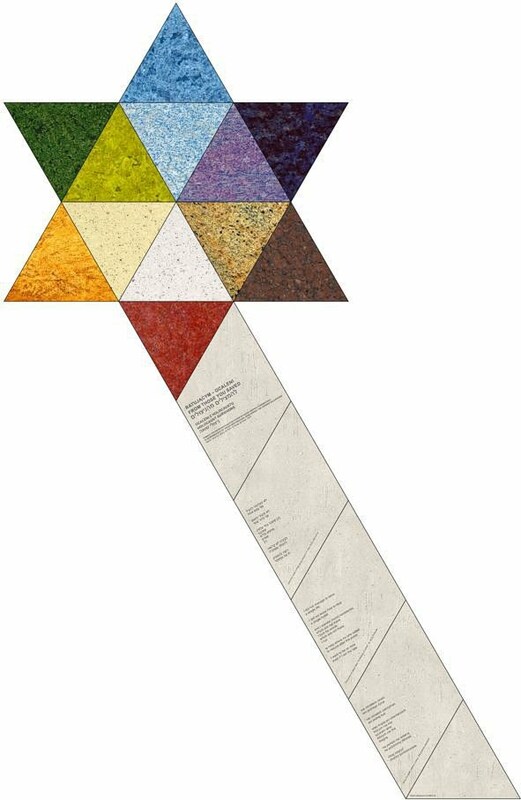 The Star of David – as a multicolour flower – may symbolise the joy of life and the varicoloured Jewish culture. Special importance in the colour composition is paid to white and red, a reference to the national colours of the Republic of Poland. On the concrete path (a symbolic flower stem) there is a poem by Jerzy Ficowski from the collection A Reading of Ashes. It indicates the direction of the work of memory and thus the meaning of the monument. The monument need not be exalted and sombre. It may be colourful. This is a medium which supports the work of memory and it should be used to help reflect on those who saved and those who were saved, on the miracle of life and empathy. The Monument From Those You Saved and the Ghetto Heroes Monument stand on the line that runs through the museum building. This location symbolically stresses the fact that the museum is a bridge between the past and the future. The monument will be part of a living space around the museum and serve as an auditorium, square, stage, and a meeting place. The ethical and aesthetic aspect of the commemoration in such a place, which is the area of the Museum of the History of Polish Jews, is to maintain its aura as Walter Benjamin described it, while not expropriating the meaning of the place that gave birth to this history. This is where the ghetto was. This square is a cemetery. I tried to take into account the ambient conditions and respect the locus. The Star of David – as a symbolic flower and real stone laid on the ground in an area that is a living scar of pain for Jewish memory – has an interior. I uncovered it, referring to the Jewish tradition of decorative arts. The Jewish survivors' gratitude for Poles who saved their life, is Jewish grtititude. It has a national character and is grounded in Jewish culture. Jews died because of their identity. The Star of David is a sign of the place of Jews in history and at the same time, the emblem of Israel. Combining gratitude with this icon gives the feeling of gratitude the greatest possible symbolic meaning, as well as the deeper symbolism of the Star of David. I tried to make the text of the inscription and the visual form become one. There is no shock, horror and pathos, no emphasis and self-expression. Only the easiest expression of the love of life, commemoration of gratitude and a transfer of the ethical guidelines from Ficowski's poem. Jerzy Ficowski (October 4, 1924, Warsaw – May 9, 2006, Warsaw) was a Polish poet, writer and translator (from Yiddish, Russian, Romani and Hungarian). During the German occupation of Poland in World War II, Ficowski who lived in Włochy near Warsaw was a member of the Polish resistance. He was a member of the Home Army (Armia Krajowa, AK), was imprisoned in the infamous Pawiak and took part in the Warsaw Uprising of 1944. His codename was Wrak and he fought in Mokotów region. Following the Warsaw Uprising, Ficowski entered a camp with other survivors of the battle. After the war, Ficowski returned to Warsaw and enrolled at the university in order to study philosophy and sociology. There he published his first volume of poetry, Ołowiani żołnierze (The Tin Soldiers, 1948). This volume reflected the Stalinist atmosphere of the early postwar Poland, in which heroes of the Armia Krajowa Warsaw Uprising were treated with suspicion at best, arrested and executed at worst, together with the sense of a new city arising from the ashes of the old. His early works show the influence of Julian Tuwim. Later he became interested in the poems of the interwar period, with elements of fantasy and grotesque. In the later period his poems reflected various moral and social aspects of life in the People's Republic of Poland. From 1948 to 1950 Ficowski chose to travel with Polish Gypsies and came to write several volumes on or inspired by the Roma way of life, including Amulety i definicje (Amulets and Definions, 1960) and Cyganie na polskich drogach (Gypsies on the Polish Roads, 1965). He was the member of the Gypsy Lore Society and translated the poems of Bronisława Wajs (Papusza). He was interested in many aspects of international poetry. He translated the poems of the Spanish poet, Federico García Lorca, and he was also a known specialist of Jewish folklore and Modern Hebrew poetry, becoming an editor of the Jewish poem anthology Rodzynki z migdałami (Raisins with Almonds, 1964). Ficowski devoted many years of his life to the study of the life and works of Bruno Schulz, and in 1967 published the first editon of what is considered the definitve biography of him, entitled Regiony wielkiej herezji (Regions of the Great Heresy, 1967). He received the award of the Polish Pen Club in 1977. His collection of poems Odczytanie Popiołów (A Reading of Ashes, 1979) has been called the most moving account of the Holocaust written by a non-Jew. As a consequence of his signing, in 1975, of the letter of 59, practically all of Ficowski's writings had become banned in Poland for the remainder of the decade, and only the emergence of Solidarity in the early 1980s has brought his works back to Poland's bookshelves. Both his prose and poems continued to be widely translated in the West. He was active in the opposition movement, and was a member of the Workers' Defence Commitee (Komitet Obrony Robotników, KOR) and subsequently of the Commitee for Social Self-defence KOR. Under the communist regime he had urged his fellow writers to voice their concerns over censorship and the suppression of workers. His most public statement was a letter to the Writers Union in which he said, “I do not believe deeply in the immediate effectiveness of letters to the government, but even less do I believe in the effectiveness of silence.” Following the fall of communism, liberalisation of Poland and its breaking with the Soviet bloc, Ficowski continued to write and translate works from languages as diverse as Spanish and Romanian, not to mention the Yiddish and Roma languages that had always fascinated him. 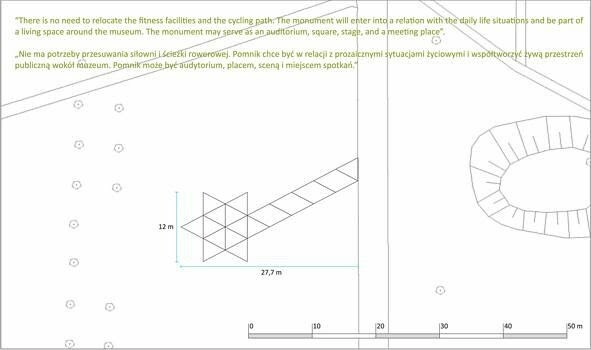 The author suggests creating an interactive website of the monument (for the Museum of the History of Polish Jews): ratujacym-ocaleni.pl and ratujacym-ocaleni.org. The address www.ratujacym-ocaleni.pl is visible on the monument (on the path). Another communication medium might be a QR (Quick Response) code. The website may provide information about the Poles who saved the Jews during the Second World War (including the 704 Righteous Among the Nations), be an education tool and disseminate knowledge about the subject. The website may furthermore contribute to profound ethical reflection. Contentwise, the website may support the celebrations of the European Day of Remembrance for the Righteous and propose a culture program. This square is a cemetery, which also asks for compassion and should be maintained as such. The commemoration of the Righteous at this place must be linked to social pedagogy, as claimed by Prof. Tomasz Gross. 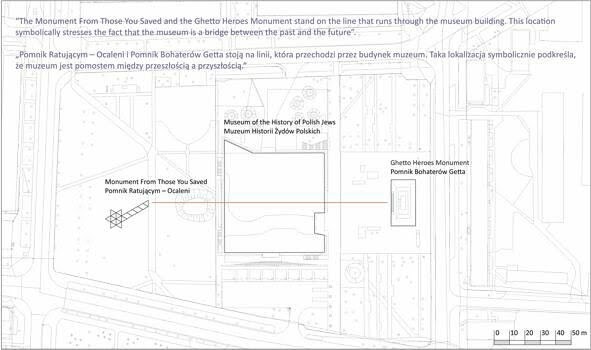 In his view, the monument to the Righteous at this place should be erected not from the private initiative of a Jew, but the initiative of the Polish state. These are two different perspectives of gratitude and memory. Jewish-Polish and Polish-Polish. The third is a transnational and timeless perspective, which is beautifully expressed by Ficowski. All of these have in common the perspective of gratitude – both for the empathy shown and the memory that continues to live. True empathy is unconditional. I wish the monument dedicated to the Righteous be a monument of empathy and that it seamlessly merge into the square that it has become a part of, reconciling the past with the present. Wersja 1 – granitowo-betonowa. Gwiazda Dawida wykonana z granitu. Betonowa ścieżka. Wersja 2 – betonowa. Gwiazda Dawida wykonana z betonu barwionego w masie oraz polerowanego. Betonowa ścieżka (kolor naturalny). Metalowe liternictwo (stal) zrównane z płaszczyzną betonowej płyty i poddane naturalnej korozji oraz ścieraniu. Gwiazda Dawida, jako wielokolorowy kwiat, może symbolizować radość życia i wielobarwność kultury żydowskiej. W kompozycji kolorystycznej ważne miejsce zajmuje biel i czerwień, czyli nawiązanie do barw Rzeczypospolitej Polskiej. Na betonowej ścieżce (symbolicznej łodydze kwiatu) znajduje się wiersz Jerzego Ficowskiego z tomu Odczytanie popiołów, który jest wskazaniem kierunku pracy pamięci, a więc sensu pomnika. Pomnik nie musi być patetyczny i ponury. 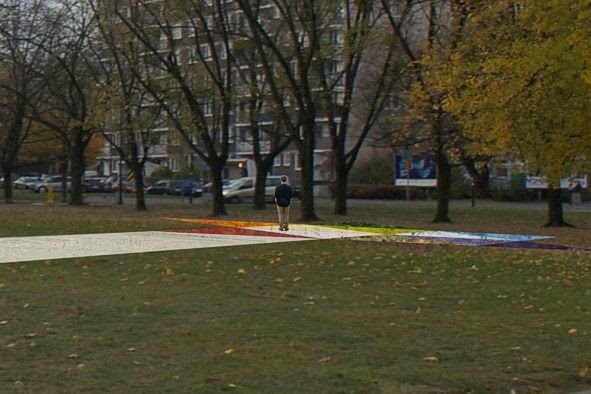 Może być kolorowy. To medium, które ma wspierać pracę pamięci i być używane do myślenia o ratujących i ocalonych, o cudzie życia i empatii. Pomnik Ratującym – Ocaleni i Pomnik Bohaterów Getta stoją na linii, która przechodzi przez budynek muzeum. Taka lokalizacja symbolicznie podkreśla, że muzeum jest pomostem między przeszłością a przyszłością. 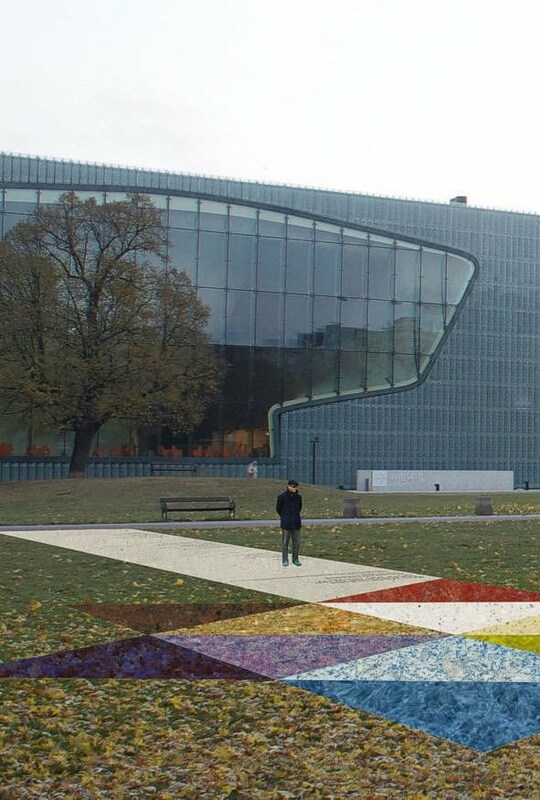 Pomnik chce współtworzyć żywą przestrzeń publiczną wokół muzeum, być audytorium, placem, sceną i miejscem spotkań. Etyczny i estetyczny aspekt upamiętnienia w takim miejscu, którym jest teren przy Muzeum Historii Żydów Polskich, polega na zachowaniu jego aury, jakby to określił Walter Benjamin, i nie wywłaszczaniu miejsca ze znaczeń, które nadała mu historia. Tam było getto. Ten skwer jest cmentarzem. Starałem się uwzględnić warunki otoczenia i uszanować to miejsce. Gwiazda Dawida – jako symboliczny kwiat i jednocześnie prawdziwy kamień położony na ziemi w miejscu bolesnym dla żydowskiej pamięci – ma wnętrze. Odsłoniłem je, nawiązując do tradycji żydowskiej sztuki dekoracyjnej. Wdzięczność ocalonych Żydów dla ratujących ich Polaków jest wdzięcznością żydowską, ma charakter narodowy i zaplecze w kulturze żydowskiej. Żydzi ginęli z powodu swojej tożsamości. Gwiazda Dawida jest znakiem miejsca Żydów w historii i godłem Izraela. Łączenie wdzięczności z tym znakiem nadaje uczuciu wdzięczności największego z możliwych znaczenia symbolicznego, a także pogłębia symbolikę gwiazdy Dawida. Starałem się, aby treść napisu i forma plastyczna stały się jednością. Żadnego epatowania grozą i patosu, żadnej emfazy i autoekspresji. Tylko najprostszy wyraz miłości życia, upamiętnienie wdzięczności i przekazanie wskazówki etycznej, którą zawiera wiersz Ficowskiego. Autor proponuje stworzenie interaktywnej witryny internetowej pomnika (dla Muzeum Historii Żydów Polskich): ratujacym-ocaleni.pl i ratujacym-ocaleni.org. Adres www.ratujacym-ocaleni.pl został umieszczony na pomniku (na pierwszym elemencie ścieżki). Dodatkową formą komunikacji, którą można zastosować, jest kod QR (Quick Response). Witryna może być źródłem informacji o Polakach ratujących Żydów podczas II wojny światowej (w tym o 704 Sprawiedliwych), służyć edukacji i popularyzacji wiedzy na ten temat. Witryna może stać się miejscem pogłębiania refleksji etycznej. Witryna może wspierać merytorycznie obchody Europejskiego Dnia Pamięci o Sprawiedliwych, proponując program kulturalny. Ten skwer jest cmentarzem, który też prosi o współczucie, i powinien zostać zachowany. Upamiętnienie Sprawiedliwych w tym miejscu musi być powiązane z pedagogiką społeczną, o co upomniał się prof. Tomasz Gross. Jego zdaniem, pomnik Sprawiedliwych w tym miejscu powinien powstać nie z prywatnej inicjatywy Żyda, lecz z inicjatywy polskiego państwa. To dwie różne perspektywy wdzięczności i pamięci. Żydowsko-polska i polsko-polska. Trzecią jest ponadnarodowa i ponadczasowa perspektywa, którą pięknie wysłowił Ficowski. Wszystkie łączy to, że są perspektywami wdzięczności za empatię i pamięci o niej. Prawdziwa empatia jest bezwarunkowa. Chciałbym, żeby pomnik poświęcony Sprawiedliwym był pomnikiem empatii i wtopił się w skwer, stał się jego częścią i godził przeszłość z teraźniejszością. Fragment wypowiedzi prof. Jana Tomasza Grossa podczas debaty POLACY – ŻYDZI: EWOLUCJA POLSKIEJ TOŻSAMOŚCI, która odbyła się w ramach konferencji Jan Karski – pamięć i odpowiedzialność, zorganizowanej na Uniwersytecie Warszawskim przez Fundację Edukacyjną Jana Karskiego oraz Muzeum Historii Polski (5-6.11.2014). „Sąsiedztwo Muzeum Historii Żydów stwarza świetną okazję, aby i polskie społeczeństwo uhonorowało Sprawiedliwych tak, jak na to zasługują. Bo kwestia Sprawiedliwych nie jest sprawą do wyjaśnienia między Żydami a Polakami, tylko wewnętrzną sprawą polską. Zaś pedagogiką społeczną na terenie lieu de mémoire, jakim jest centrum warszawskiego getta, powinny się zajmować autorytety państwowe, a nie osoby prywatne. Sprawiedliwi to przecież ‘żołnierze wyklęci’, którzy wbrew zarówno Niemcom, jak i współziomkom przechowali w czasie wojny nie tylko Żydów, ale również honor i godność narodową Polaków. Żydowski filantrop, który przeżył Zagładę, wystawiając w tym miejscu pomnik wdzięczności za własne pieniądze, nie miałby tytułu, żeby na nim umieścić tabliczkę objaśniającą intencje donatora takimi słowami: ‘Polakom, którzy narażając na śmierć z rąk niemieckiego okupanta siebie i najbliższą rodzinę, nieśli bezinteresowną pomoc bliźniemu, Żydowi, działając w osamotnieniu, wbrew wrogości polskiego otoczenia, ratując w ten sposób również i honor Narodu Polskiego – wdzięczni Rodacy’. I pasowałoby, żeby na cokole znalazł się jeszcze podpis: ‘prezydent, Sejm i Senat Rzeczypospolitej’. A kiedy będziemy potrafili tę prawdę wypowiedzieć w przestrzeni publicznej, to będzie znak, że Żydzi – od tysiąca lat współgospodarze tych ziem – powoli przestają być polskim problemem i stają się nareszcie częścią polskiej historii”.